When it comes to improving their game, many golfers think it’s all about honing technique and skills. They work on their grip, swing, tempo, they practice in the bunkers, practice on the greens, take trips to the driving range. It’s a merry-go-round of self improvement. But few club players consider physical fitness as the first step towards golfing glory. Trying to correct that notion is Newcastle golf fitness trainer and current NSW Country Amateur Champion, Chris Smith. 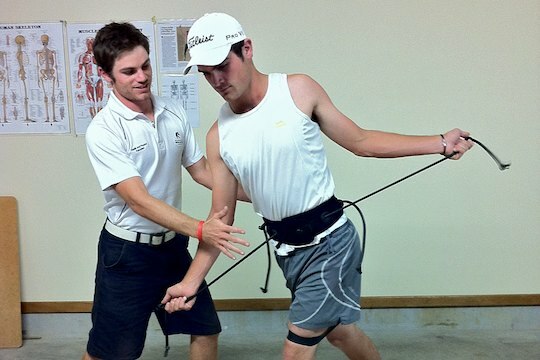 The 24-year-old physical education graduate reckons that golfing fitness is one of the most overlooked essential elements of the game. “When a golfer wants to improve his game he thinks equipment first, technique second and then fitness a long way behind,” said Chris. “A lot of club golfers have office jobs. They’re leaning over a computer, have rounded shoulders, rounded backs and that creates floors in the golf swing. It’s going to restrict the turn and affect the club path as well. Chris reckons the only answer is to put a correction exercise program in place to help the body do what you’re asking of it. “Most amateur golfers have poor mobility through the hips, poor spinal flexibility and weakness through the core,” he said. “Even among the most unfit, a few hip stretches and resistance band work might be all that’s needed to lift the game. Not only has Chris applied this theory to his own game, which has seen him take out the NSW Country amateur championship in 2010, Newcastle District Championship and three of the last four club championships at his Belmont Golf Club base, but he’s now crunching the numbers in the final stages of a research masters degree on the effects of golf-specific strengthening and conditioning on the performance of juniors. “I’ve noticed kids’ posture is getting worse and worse with the rise of Facebook and texting and time spent at computers. Kids aren’t outside enough,” said Chris. He’s been working with promising Newcastle juniors to improve their fitness, encouraging daily drills to activate muscles and set up good posture. “I’m just trying to get to them early on, and hopefully as they grow into the professional ranks they already have those fitness skills,” he added. Chris has also been working with his brother, Brendan, who last year turned professional and recently took out the Australian 4Ball Championship. He’s toyed with a professional golfing career himself but is leaning more towards a long-term role in golf fitness training which has already seen him take on a string of clients. “Too many older golfers are concentrating on keeping their handicap low, when they should be focused on longevity in the game. They should be protecting against golfing injuries like lower back and shoulder problems. If you want to keep playing into old age, you have to stay fit enough to walk the course,” warns Chris. “At the end of the day golf will always be a skills sport. There will always be a John Daly out there who is a good golfer despite his fitness, but those examples are few and far between. Why get fit for golf? You Be The Judge: Heartbreak or Hole-In-One?